The silvery blue shimmer of moonstones complemented by the warm radiance of yellow gold. This elegant dress set (a pair of cufflinks and four shirt studs) captures the bold simplicity of Mid-Century design. 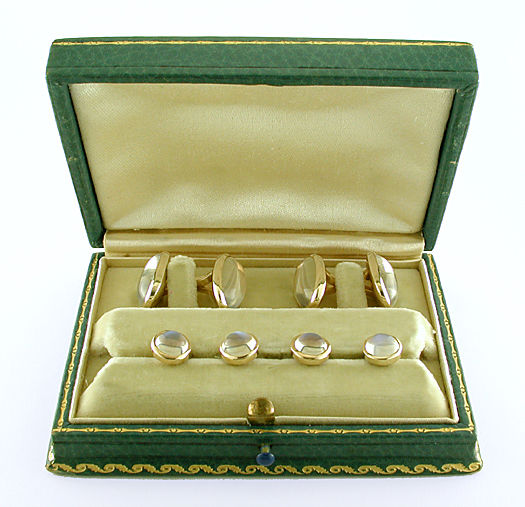 The design of the cufflinks, shirt studs and the accompanying fitted case (see photograph below) help date this dress set to the 1940s - 1950s. Crafted in 14kt gold, circa 1950. 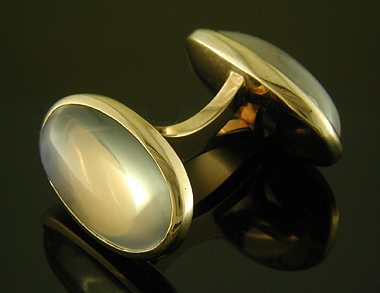 Complementing the cufflinks, the four shirt studs feature small, round cabochon-cut moonstones set in a gold bezel. The shirt studs (one pictured above) are 5/16" in diameter and 1 1/16" long. The cufflinks are well crafted with sturdy fixed bridges and strong bezel settings securing the gemstones. 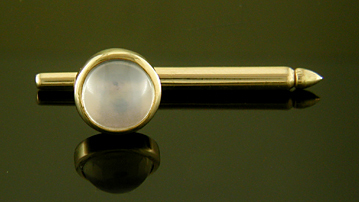 The brightly polished gold plays beautifully with the billowy, bluish sheen of the moonstones. Cost: Although this dress set has sold, you will find many more elegant dress sets and cufflinks in the Antique Dress Set Gallery. 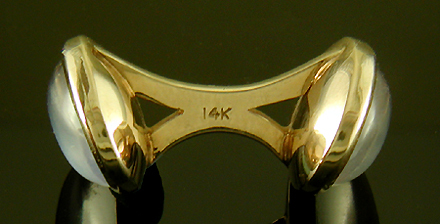 Measurements: The oval tops of the 14kt gold cufflinks are 11/16" by 7/16". They weigh a total of 13.4 grams. The measurements of the shirts studs are noted above. This dress set comes in its original fitted case. The interior of the case is off-white velvet with a white silk lining in the top. The exterior is green with gold scrolls and piping and a small, blue push button. Like the dress set, the case is elegant with a little pizzazz!